A dog died and person was transported to a hospital Friday afternoon following a two-alarm apartment fire in Bay Point, authorities said. A man was engulfed in flames and a dog died Friday afternoon following a two-alarm apartment fire in Bay Point, authorities said. 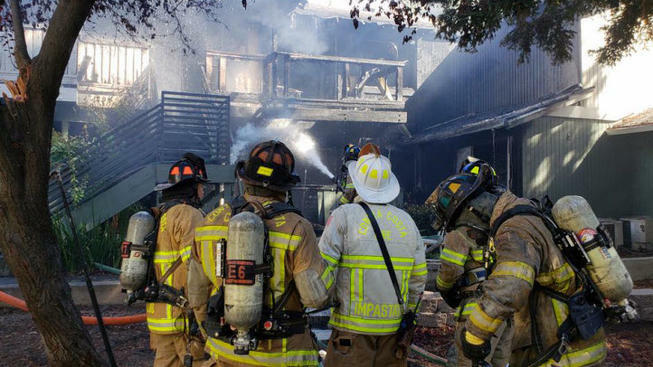 Firefighters responded to the Hidden Cove Apartments around 2 p.m. and found neighbors scrambling to save a man who was on fire as flames reached the roof of the building. "His mouth was like charcoal like you eat charcoal out of the BBQ pit," said witness Erica Williams. "His skin was burnt off his fingertips his hair was singed all the way to the back." The blaze on Mary Ann Lane involved three units, firefighters said. Firefighters were able to rescue four other dogs and three birds from the flames and smoke. "His faced looked melted, literally, all I could do was pray with him," said Williams. Another woman is alive thanks in part to her neighbor, who managed to catch her from her second floor window. "I caught her dog. I told her to jump herself then she jumped," said Nijeer Scott. "I felt really good, really good because this is my first time experiencing something like this, and I saved somebody’s life."